The same redirection happened with Chrome, without any security warnings. Is there a real security problem with bitaddress.org? The certificate for www.bitaddress.org is issued by PositiveSSL. Chrome trusts them (PositiveSSL), firefox does not. There are an awful lot of issuers, and different browsers are bound to have slightly different lists. If you trust them or not is up to you. 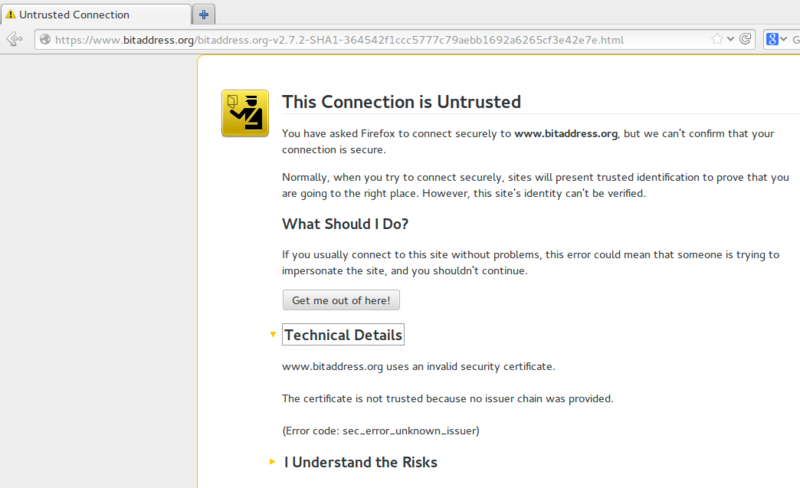 If you trust Chrome's security, then you can trust that certificate. If you "add exception", then BEFORE confirm security exception, you can "View..."; you can check the fingerprint (SHA1 & MD5), and if they match, then the security is the same between Chrome and Firefox (not necessarily good, just the same between the two browsers). If they are different, then someone is doing something SERIOUSLY FLAKEY! Not the answer you're looking for? Browse other questions tagged security offline bitaddress.org or ask your own question. Is the tenebrix client safe? How safe is a brain wallet? MultiBit Password Protection - How Secure is it? How to use Bitaddress.org and Blockchain.info with Testnet coins? How to download bitaddress.org to use offline? Cannot access blockchain.info through Tor browser?